The Sunpak 120J II Flash Kit offers a bare bulb-style on-camera flash for Nikon cameras with i-TTL functionality. The bare bulb lighting style provides a more natural, rounded lighting pattern compared to the rectangle shape common with modern Speedlights. It also features a guide number of 177' at ISO 100 and 105mm which contributes to the effective range of 4.3 to 190.3'. The 120J II also includes an external power pack and cable for a fast recycle time of 1 second. The 120J II has a bounce and swivel head that allows you to change the position of your light to get the best lighting for your situation. The settings can be changed on the LCD control panel on the rear of the device to add more control to your shooting. Additionally, it features wireless TTL capabilities for using off camera. This flash can also operate on 4 AA batteries and has a recycle time of about 3 seconds. It also includes a case, stand, bag, strap, and reflector. Box Dimensions (LxWxH) 15.4 x 10.6 x 6.2"
120J II Flash Kit for Nikon Cameras is rated 3.3 out of 5 by 4. Rated 2 out of 5 by MeteoAdriatic from Much less powerful than expected I expected it to be more powerful than for example Nikon SB-910 speedlight. Speedlights have typically around 70-80Ws of energy and this one should have 120Ws. At least I thought it to be. However, comparing outputs, it gives about a full stop less amount of light comparing to SB-910. So in Ws terms it is not more than 50Ws, probably even less than that. Everything other is positive about this kit. 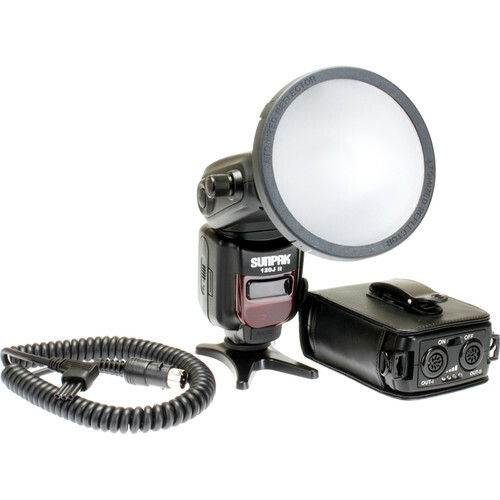 It comes with excellent external high voltage power pack, that can also supply with direct high voltage Nikon speedlights and recycling them almost instantly. Build quality seems decent enough. However, for a amount of light it outputs, I would say it is not worth the price. Rated 5 out of 5 by Jerry from Small Sunpak Scores Big Hit! This compact on camera flash for my Nikon D-800 and D-700 made me wonder why it didn't cost more.It works well in TTL mode mode, but as a Professional , I prefer manual mode. It performs just as promised in the B&H prouct description, cost 1/2 the price of the Nikon 910,and is reliable. I trused it so musch, first tme out I used it for a wedding! Came home with exactly what I thought I would...Excellent exposures and no harsh shadows, not one!All the light looks natural and soft! Rated 4 out of 5 by Anonymous from Very good product at a low price I bought it for weddings and social photography. Just arrived I took him the next day at a wedding, I only worked with him, excellent behavior, with a rapid battery recycling. Lightweight portable, Battery life of approximately 2000 photographs powers quarter, 1/16 and 1/32. after the wedding I took him to work at a school, on the second day the first batch sold out. Very reliable. It has not failed me in flashes in the first week of work. In contrast, missing accessories for light boxes and umbrellas. The front of the reflector is released easily. No where to get the bare bulb flash parts if needed. The product website does not give information on this. An instruction manual in PDF not get anywhere missing. When the AA battery compartment does not fire and run out the power pack is plugged. Overall I liked it. I will buy one in the coming days. Rated 2 out of 5 by Alain Claveau from Power not as per rated I was very excited when i saw this flash was comming as a succesor of the famous 120J. So i waithed patienly for the release of it. Wen i got it, put everyting togheter charge the battery, but the pack on my belt, and the clip snipe right out. I was not too concern about that, has i could fix it with a metalic clip from and old measuring tape, or cut two slit on the flash case and put my belt tru it. Holding the pack at waist level i found the cord a bit too short for my taste. But the real deal breaker is the power.I have checked it against my SB900 on manual mode (full power ) zoom head ajust at 105 mm to match the spec from Sunpack. the GN for the Sunpak is 177 and 111.5 for Nikon. The 120j is giving me one stop less , i was expecting the opposite. To me this is not acceptable, and its a huge deception. I was expecting this flash to equal two sb900. My purpose was to use it off camera in a softbox wen i shoot weddings. Sorry but I had to returned it.